Before you snuggle up in front of the hearth, be sure to banish ashes, stains, and creosote build-up. Curling up in front of a fire is a thoroughly delightful aspect of fall and winter. But fires can be a messy business, and neglecting a fireplace leads to dark stains not just in the wood burner but also around the hearth and mantel. Aesthetics aside, cleaning the fireplace is a matter of safety: The National Fire Protection Association recommends both your chimney and fireplace be inspected for soundness and cleaned annually, as build-up of creosote (an oily wood-tar by-product found on chimney walls) can cause fires to flare out of control. 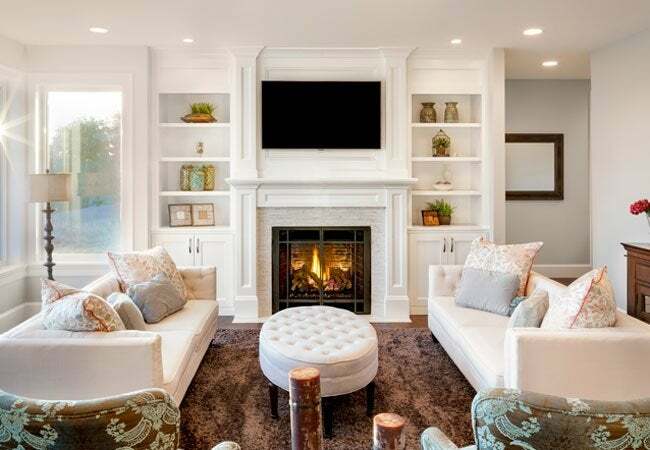 Here’s how to clean a fireplace and sidestep potential fire hazards all season long. Wait at least 12 hours after your last fire before attempting to clean a fireplace in order to give it a chance to cool down fully. Clear a working space and cover the area around the fireplace and nearby furniture with drop cloths or plastic sheeting (not newspaper—the ink can transfer onto carpets or upholstery). Don’t skimp on protection, as this promises to be a sooty project. Wear old clothes, which are sure to get stained, and rubber gloves. Don a dust mask to avoid inhaling potentially carcinogenic dust. If you don’t have kneepads, work on a thick folded towel to avoid painful pressure. Remove all the ashes and dust from the fireplace, using a small shovel or hand broom to collect it on a dustpan. Dispose of the mess in a heavy paper bag or garbage can. Sweep dust and ashes off the andirons or grate, then take them outside to clean. To remove soot from the grate/andirons, apply a few teaspoons of dish detergent to a water-dampened scrubbing brush, wet the grate/andiron with water, scrub until sudsy, and rinse well. Dry the grate/andiron off with the clean rag, and leave it aside until you clean the fireplace. Using a dry bristle brush or hand broom, start at the top of each wall and sweep down to remove ashes and creosote. Repeat as many times as necessary. Sweep out the ashes and debris, and place them in the paper bag or dust bin. For good measure, you may wish to vacuum the area for any remaining dust. Mix 3 tablespoons of TSP (a neutralized combination of phosphoric acid using sodium hydroxides), ½ cup of bleach, and a quart of hot (not boiling) water in a bucket. Fill a spray bottle with this cleaning solution and generously spray fireplace walls and floors. Let it sit for five minutes, then spray again for scouring. To scour the fireplace, dunk the bristle brush in the remaining solution and scrub the walls, starting at the top and working down. Occasionally spray with cleaning solution, both as a rinse and cleaning aid. Use the old rags to wipe after scrubbing, and spray and repeat scrubbing process if required. Scrub the fireplace floor, sopping up the extra cleaning agent with rags. If your fireplace has glass doors, mix a 50-50 white vinegar and water solution in a fresh spray bottle (you’ll need about a cup). Spray glass doors and some folded paper towels with the vinegar solution, then sprinkle some ashes onto the toweling to act as a light, natural abrasive. Gently scour the doors, and repeat the process with fresh paper towels. 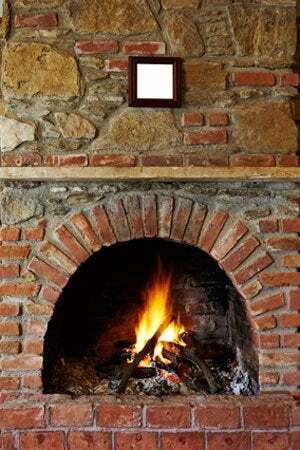 If you have a brick fireplace front or facing that’s more than 50 years old, vacuum the area to pick up soot and dust. Do not scour it, as that could cause old brick to crumble. For all other facings, mix ¼ cup liquid dish detergent and a gallon of water in a fresh bucket. Put clean, fresh water in a spray bottle and spray down the facing. For wood and brick, the water spray will prevent the cleaner from soaking in too deeply, too fast. For marble and tile, spraying will serve as a presoak. Dip your brush in the bucket of detergent water and lightly scrub the facing surface. Accept that some stubborn stains will remain; overzealous scrubbing can do more harm than good. Spray the facing front with plain water and wipe dry with clean, dry rags, or paper towels. Replace the grate or andirons. Clean your brush and broom with liquid dish detergent and water. Starting from the perimeter, gather your drop cloth or plastic sheeting up in a ball and throw it out. Before you toss the ashes, consider spreading them over your garden: Ashes (not creosote) are a great source of calcium, potassium, and other nutrients for plants that like low-acidity, high-pH soil. And if you have issues with slugs, snails, or other soft-bodied pests, lay ashes around plant bases as a deterrent. Store ashes in a dry, air-tight container and you’ll have them on hand to replace after rainfalls, which will wash away the ash salt that repels invaders.